Hard on the heels of the Daily Mail’s re-hashing of a salacious story about Marilyn Monroe from sixty years ago as if it were the latest sensation, the anthropopper will not be outdone in recycling old news and is proud to reveal that … Marilyn Monroe was an anthroposophist! Intriguingly, this does appear to be a true story. The following quotation is taken from a biography of Marilyn Monroe called “Norma Jean: the Life of Marilyn Monroe” by Fred Lawrence Guiles, published by McGraw-Hill Book Company, New York in 1969. It appears on pages 331-332 of the 333-page book. “Some years before her death (in Dec. ’64), Dame Edith (Sitwell) had spent a winter in Hollywood. A meeting between the poet and Marilyn was arranged by a monthly magazine. It was thought their ‘opposite’ personalities would throw off some journalistic sparks. No one could have foreseen that they would become immediate friends, nor could anyone have known that their deaths would be marked in an almost identical way — while their legends were growing in their lifetimes, they had been taken seriously by too few, too late. In Dame Edith Sitwell’s autobiography Taken Care Of, she tells of her meeting with ‘Miss Marilyn Monroe’, who she describes as quiet, with great natural dignity and extremely intelligent. She was also, she said, extremely sensitive. Dame Edith tells of a magazine article that she was commissioned to write about her visit to Hollywood and this included a face-to-face encounter with Miss Monroe, who she suspected the magazine moguls thought would hate one another on sight. They were mistaken. 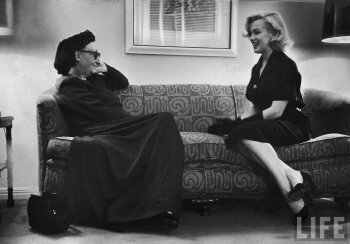 Edith Sitwell and Marilyn Monroe, 1953 Photograph by George Silk/LIFE © Time Inc.
“While living in Spring Valley in 1980, I had the good fortune of meeting the person who had sent Marilyn that copy of Steiner’s autobiography as well as a number of other Steiner books and lecture cycles that Marilyn requested over a ten year period from the Anthroposophical Library, then located at 211 Madison Avenue in New York City. I speak of the late Agnes Macbeth, wife of the late Norman Macbeth (author of “Darwin Retried”). Agnes worked for the library during the 1950’s, handling book requests and she vividly remembers the letters Marilyn posted asking for various lecture cycles. And although Marilyn had a reputation for tardiness and irresponsibility on her movie sets, Agnes assured me that Marilyn was very conscientious and punctual with her returns of the books. Marilyn Monroe was introduced to Steiner’s writings and lectures by her favou rite drama teacher, Michael Chekhov (1890-1955), nephew of the playwright Anton, and fellow director with Stanislavsky in the Moscow Art Theatre early in the 20th century. Marilyn was introduced to Chekhov in 1951 by one of his devoted students, the American character actor Jack Palance. Marilyn opened herself like a sponge to water to Chekhov’s approach to theatre, which was so deeply influenced by Steiner that Chekhov left Stanislavsky’s method behind. And Marilyn opened herself very deeply to anthroposophy, not because she felt it would please her teacher, but Chekhov felt that it was one of the only times in her life that Marilyn did something out of her own free inner being. This is fascinating. 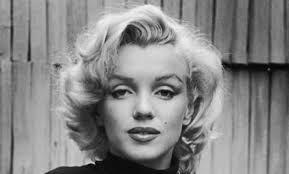 I truly wonder then, if Marilyn shared anything about Anthroposophy with FFK? I’m sure Dominique must have meant to type “JFK” or John Fitzgerald Kennedy. I doubt that Marilyn and JFK had any discussions at all about Rudolf Steiner. If I may express myself more delicately now in the quaint English dialect of “Classical Anthroposophese,” as it were, JFK was interested in sharing with Marilyn only through his “lower larynx,” not his upper one. Tom, do you speak from any first hand experience regarding what JFK “was interested in sharing”; or simply guessing while pretending to know? This is most interesting and sheds a whole new light on the famous star. My first cousin is (was) Norman Macbeth and I grew up hearing snatches here and there about this, that Agnes, his wife, would send anthro books to Marilyn Monroe. What a mystery! Hello Cuteroot! How wonderful to read about your connection to Norman and Agnes. My God, has it really been 34 years since I spoke with Agnes about MM? Yes it has! But an even greater and more vivid memory (yes, I’m phlegmatic) of Agnes from that time of 1980 in Spring Valley, NY, was the exquisite pastries Agnes would serve us after the study group meeting on the World Economy lecture cycle tat Norman hosted at their house. Of course the person who could tell us a lot more about this MM connection to RS is their daughter Christa Macbeth, who I understand is directing and acting in theater performances in Chicago. Hello Jeremy! I am delighted to see that you have rummaged through the Cyber-Attic of Internet Steineriana and discovered my antique article about MM and RS. To return the favor, I am sending you by email my parody of a Gilbert and Sullivan song called “The Very Model of a Modern Anthroposophist.” It was quite a Steiner-Facebook Group hit in early 2013 when I posted it there. If you like it, please feel free to post it on your blog here. Thanks again for providing this little retrospect for me. Why, it actually struck me as a wee bit of Kama-Loka nudging me from the future. Good to hear from you and thank you for your original article, which has certainly created a lot of interest amongst fans of MM – I’m currently getting over 1500 views per day of this post. I’m delighted also that you and Cuteroot have connected through this. where it appeared in 2011. I sure would get a kick out of seeing that video. If you feel like sharing it I’m at Kathy@firefox-inc.com. Hi Kathy, I have no idea what video you are talking about. I dont appreciate when anyone speculates about the throat of JFK but rather find it disgusting! This article inspires me to mention that one of my teachers, Michael Chekhov’s Colleague George Shdanoff told me MM invited George to her home one week before she died. She expressed great distress over the approach to acting that she had taken up under Strasberg since 1956 after Mr. Chekhov died(Sept. 30th, 1955). She made arrangements to return to his Steiner inspired Chekhov Technique with George as her teacher. George was still coaching Jack Palance, Patricia Neal, and many other noted actors. Another interesting bit of info that arises for me is that Mr. Chekhov always wanted to play King Lear but was too self conscious about his accent. However, he did apparently play Lear to MM’s Cordelia in class and to those who witnessed it, it was quite a special event. So Dame Stilwell was in good company in sensing a Shakespearean Heroine in MM. Hello Lisa! How wonderful to hear from you! Once again I am treated to a retrospect of my life here on Jeremy’s blog, and with you, it’s a real joy to reminisce. I hope actual Kama Loka will be this nice! Now I can’t recall if we met in person, but if we did, it had to be ten years ago in Old Pasadena at a Michael Chekhov workshop with Mala Powers at the Los Angeles Branch of the Anthro Society, now called the SoCal Branch. At any rate, I heard a lot about you from Mala and I believe at that time you were living in Los Angeles and holding your own Chekhov Acting classes. And I’m so glad you told the Lear-Cordelia story about MM and MC. It jogged my memory to realize that I had heard that same story from Ted Pugh, whom I had gotten to know during a year I had taught at Garden City Waldorf, NY, 1981-82. At that time, he was working with Fern Sloan. Thanks so much for commenting here, Lisa. Reading books does not make one an anthroposophist!!!! It’s interesting that she read those books, but assuming that she was an anthroposophist because of it s another matter. Headlines don’t always (or often) accurately represent a story. But it’s an interesting story nonetheless. Hi Andrea — yes, the reading of the books does not do that . . . but after 47 years of being a student of anthroposophy, I’ve learned to not rely upon the expression, “anthroposophist” — it’s a pesky reminder that labels are a pesky currency in our culture . . . In your heart-of-hearts, you might ‘name’ yourself what you wish — but when conferring that label upon others, pay close attention! as in: WHO is saying WHAT about WHOM? “Anthroposophism” is widely practiced in our time, wrapping oneself in the garb of anthroposophical materials, be they lectures or books. Anthroposophy is a path of knowledge. “Anthroposophist” — that’s a label that has less and less meaning, the more one tries to use it. And Marilyn? I hope it was helpful for her — the same wish I have for anyone who spends time with Dr. Steiner’s splendid gift to humankind. I also read somewhere that Marilyn was exceptionally intelligent. I have always been fascinated by her and have wondered who she really was. I feel she was ill-served by many around her. I am glad she connected with RS and feel that this will mean a lot for her future development.